On high windswept terrain on extension of Tibetan plateau around scenic Upper Mustang. Explore impressive Mustang farm villages of great interest and its impressive monasteries. 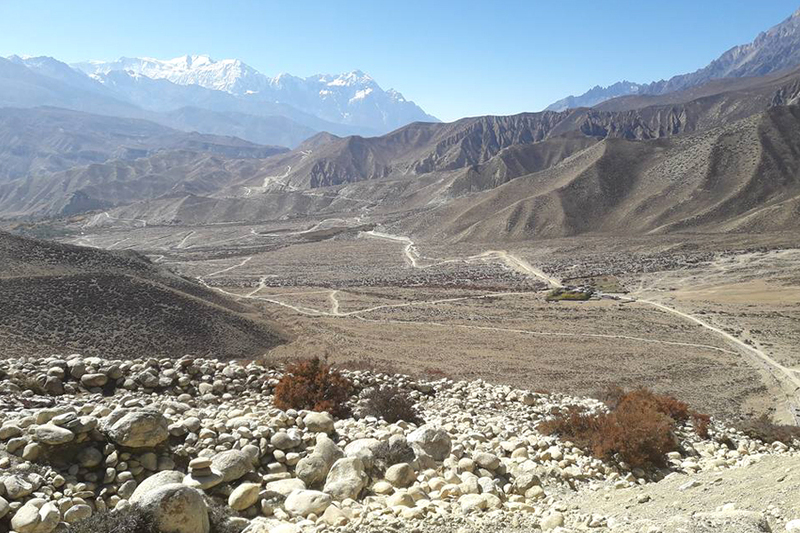 Walk leads into former walled kingdom of Lo-Manthang within high and dry Upper Mustang. Grand panorama of Mustang Himal with Dhaulagiri and Nilgiri’s on daily exciting walks. Trek on old Trans-Himalayan Salt and Caravan Route of Nepal and Tibet through Mustang. Fabulous highland with incredible views of picturesque landscapes and high peaks. Sweeping scenic flights to and from Pokhara-Jomsom with amazing views of peaks. Enjoy waling into cultural villages of Mustang with age-old traditional life and custom. 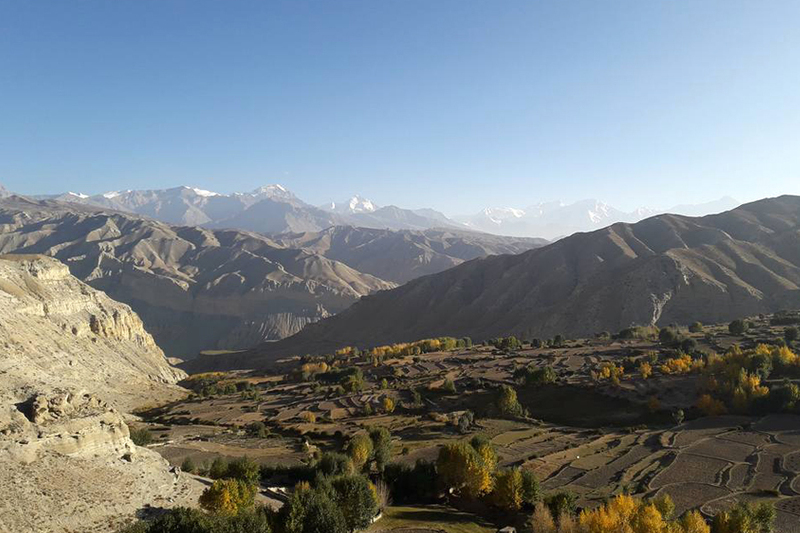 Upper Mustang Trekking, one of most photogenic and scenic country on this planet located on an extension of vast Tibetan South West plateau, considered as world’s highest and largest. 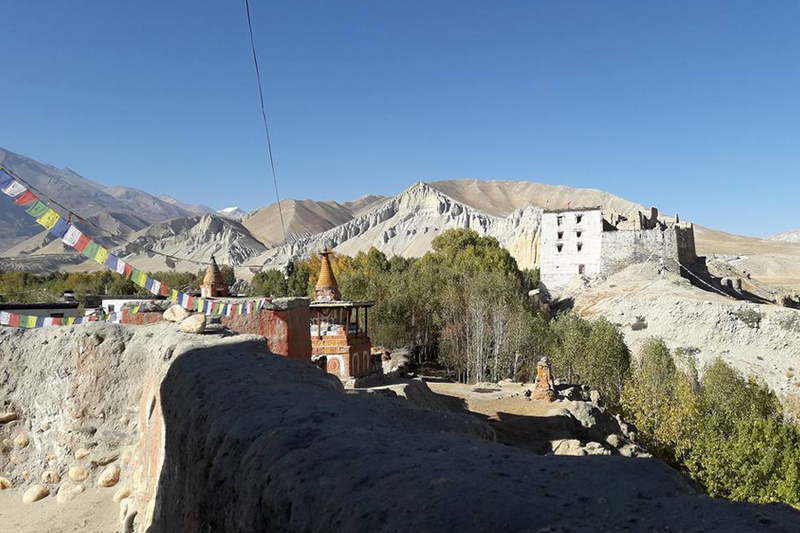 Upper Mustang Trekking certainly an adventure where you can immerse within grand beauty of its natural surroundings of desert like landscapes, eroded canyon and high cliffs dotted with smaller caves used for meditation and preserving ancient artifacts of great religious importance. An adventure leads you to explore its interesting cultural villages interwoven with old Buddhism religion and as well practice ancient Bon (pre Buddhism) worshipping natural spirits and mountains, where visit leads you to impressive monasteries decorated with fine colorful religious painting know as Thanka. Truly a great experience Upper Mustang Trekking entering into former walled old kingdom at Lo-Manthang visiting its narrow streets around villages and towns with similar traditional life of Tibetans where the border at mere distance from Upper Mustang area. Starting our beautiful and scenic Upper Mustang Trekking from beautiful Pokhara a renown touristic spot of Nepal, where a super short flight takes you to land at Jomsom, the headquarter town of Mustang district. Jomsom, home to Thakali people who have been on trade with Tibet on this old Trans Himalayan Caravan Route since past hundred of centuries, from here heading higher into wide windswept beautiful country of Upper Mustang, towards Lo-Manthang the former old kingdom of Mustang. Enjoy the fantastic looking villages with rows of prayer slabs known as Mani with series of long prayer bells that welcomes visitors to its villages, of Chusang, Ghami and Charang to reach at historical Lo-Manthang, visit its monasteries and former palace fort of late Mustang Raja (king). After a great wonderful experience heading back to Jomsom taking an alternative route via holy Muktinath, a famous pilgrimage spot for both Hindu and Buddhists with super views of Dhaulagiri range of peaks, where our marvelous Upper Mustang walk completes at Jomsom with scenic flight back to Pokhara. Day 2 : Fly to Pokhara 860m (220 k.ms) 30 min by air. Day 3 : Morning flight to Jomsom 2,715 m visit charming Marpha village 2,500 m.
Day 4 : Drive to Chusang 2,820 m and start walk to Samar 3,290 m - 05 hrs. Day 5 : Trek to Ghiling 3,570 m - 06 hrs. Day 6 : Drive to Ghami and walk to Dhakmar 3,520 m - 05 hrs. Day 7 : Trek to Lo-Manthang 3,810 m - 05 hrs. Day 8 : At Lo-Manthang for local excursion and explore the village-town. Day 9 : Trek to Yara 3,650 m - 06 hrs. Day 10 : At Yara explore around Luri Gompa. Day 11 : Trek to Tangbe 3,240 m - 06 hrs. Day 12 : Trek to Tetang 3,040 m - 06 hrs. Day 13 : Trek to Muktinath 3,760 m - 06 hrs. Day 14 : Trek to Jomsom 2,715 m - 04 hrs. Day 15 : Fly to Pokhara and transfer to hotel. Day 16 : Drive or fly to Kathmandu and then transfer to your hotels. Day 17 : Depart for your next destination. All ground transportation as per itinerary private/local. Accommodation in Kathmandu and Pokhara at 3 star hotel with twin sharing basis and breakfast as per the itinerary. First aid, medical kit and Oximeter. All necessary documents and trekking permits. Farewell dinner in a Nepalese restaurant on your last evening in Kathmandu. Tip for guides, porters and drivers. (Minimum 10% of the whole trip cost.) according to our company rule. Personal trekking gears, sleeping bags, down jackets, etc. Travel and emergency evacuation insurance of clients. Clients must have insured emergency evacuation. Day 2 Fly to Pokhara 860m (220 k.ms) 30 min by air. Morning depart from hotel to Kathmandu domestic airport for interesting and scenic short flight to Pokhara, beautiful views of Himalayan mountains from Langtang, Ganesh-Manaslu to Annapurna Himalaya range of peaks. On reaching at Pokhara transfer to respective hotels located nearby Phewa Lake for overnight stops with time for walks around. Pokhara a beautiful, renowned touristic city blessed with natural beauty placed on the laps of massive Annapurna Himalaya with magnificent Machhapuchare Himal ‘Fish Tail’, a virgin and unclimbed peaks of Himalaya. Day 3 Morning flight to Jomsom 2,715 m visit charming Marpha village 2,500 m.
After pleasant stop in Pokhara, morning transfer to Pokhara airport for short scenic flight to Jomsom, headquarter town of Mustang district, during air exciting close views of Annapurna and Dhaulagiri mountains. At Jomsom transfer to lodge with time in the afternoon short walk to a charming village at Marpha famous for delicious apples and its products, where houses painted white with an interesting monastery. Jomsom and Marpha located with Lower Mustang, one of the main villages of Mustang area with Jomsom as headquarter, the home of Thakali tribe interwoven with Buddhism religion and culture. Day 4 Drive to Chusang 2,820 m and start walk to Samar 3,290 m - 05 hrs. From Jomsom our adventure begins taking a drive past Kagbeni village, heading uphill on leaving Kali-Gandaki River behind. Drive leads towards barren countryside all the way with occasional stop, passing through some small villages as ride progress drive past Tangbe, another hour of good journey brings you at Chusang line up with few trees amidst the red earth surrounding. Chusang lies at the confluence of the Narsang stream and the Kali Gandaki River. At Chusang begins our actual walk leads to Chele village after crossing a stream through broken canyons and ruin castle walls on the surrounding cliffs, across the river from Chusang are some spectacular red eroded cliffs above the mouths of inaccessible caves. After crossing the small bridge an uphill walk for 45 minutes brings you to Chele village, where walk gets steeper for an hour up at a ridge above 3,130m, from here great views of Gyagar across a huge canyon. Trek continues with a slow climb on the windswept terrain till the pass is reached at 3,540 m and then gradual descent leads you at Samar for overnight stop. Day 5 Trek to Ghiling 3,570 m - 06 hrs. Morning walk leads to a short climb above Samar village to a ridge, with downhill heading to a large gorge past a Chorten painted red, black, yellow and white-all the colors are made from local rocks. The journey continues into another valley with juniper trees, after crossing the stream the walk follows uphill path to a ridge at 3,800m, the trail climbs over to another pass, from here the route descends to Shyangbochen, a small settlement with few tea shops at 3,710m. After a good break here, the trek continues to a gentle climb to a pass at 3,770m entering towards a huge valley, from here taking the right downhill path towards our overnight stop at Geling with its large fields of barley on the outskirt of the village. Day 6 Drive to Ghami and walk to Dhakmar 3,520 m - 05 hrs. From Geling, our route climbs gradually unto fields to the centre of a valley, past below Tama Gung settlements walk continues with long climb across to a valley and then cross Nyi La pass 3,950m. The highest point of the trek as well the southern boundary of Lo. From here a gradual descend for half hour brings to junction; the right path leads direct to Tsarang while the left leads to Ghami village for overnight stop one of the main major of Lo region. Day 7 Trek to Lo-Manthang 3,810 m - 05 hrs. Today’s walk leads to our main destination at Lo Manthang, walk begins with short descend crossing Charang-Chu River with steep climb to a ridge, then past Tholung valley. The trail diverts north with gentle climb as walk ascends to a large Chorten, which marks the boundary between Ghami and Tsarang with Lo. As climb follows to a stream, coming to a great wide windswept landscape, finally reaching on top of a hill at 3,850 m, offering grand view of walled former kingdom of Lo Mananthang, where short descent brings you to a stream that outlines the walled kingdom and a village, form here a short climb on a plateau that leads you to southern wall of Lo Manthang village. The only entrance to the village is from the northeast corner, so one has to circuit the wall to the main entrance gate sometimes. Day 8 At Lo-Manthang for local excursion and explore the village-town. At Lo-Manthang to explore this amazing place, which is a large village about 150 houses plus number of resident for the lamas, the houses are closely packed, and the palace and monasteries are in the bottom portion in this vertical part of the L shaped houses. The school, health post, police post and several important chhorten are located outside the walls to the north of the gate and east of the monastic part of the city. Despite the apparent squalor of Lo Manthang, the village is prosperous and maintains a strong sense of community. Though the people call themselves Lobas, people from Lo, they are very much Tibetan and practice a practical culture economy. Before strong trade with Tibet was disrupted, all of the salt and wool trade on the Kali Gandaki passed through Lo Manthang, and this brought a substantial amount of money to this great village town. The Mustang raja’s palace stands an imposing 4 storey building in the centre of the city. 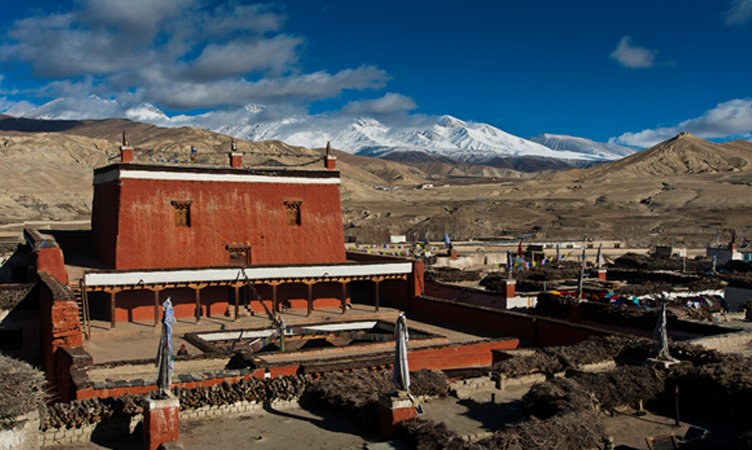 It is the home of late Raja, Jigme Parbal Bista, and the rani (queen), who was from the noble family of Lhasa. Day 9 Trek to Yara 3,650 m - 06 hrs. After breakfast return journey using the same route for some hours with pleasant walk, where our trail diverts heading east-ward with steep descends leading to a small village of Dhi situated on the bank of the Phuyung Khola. The trail crosses the small wooden bridge over the Phuyung Khola and climbs steeply to reach the small village of Yara where the Buddhist player flags greets you, explore the incredible erosion landscape on the way to Yara village. Day 10 At Yara explore around Luri Gompa. A rest day at Yara to explore around this amazing country where few hours of walk from Yara village brings to a small settlement of Luri Gompa and explore Luri Gompa and caves of full of Gompas (monastery and shrines). Day 11 Trek to Tangbe 3,240 m - 06 hrs. After an interesting and fascinating time above high country of Upper Mustang and in Luri Gompa with historical and impressive phenomenal monastery, starting morning on a high trail through grass less and barren, arid terrain with just bare red eroded hills weathered by strong winds and snows, and then walk slowly encountering a small ridge top to head downhill to Tangbe village at 3,370 m high, this is a moderate size village of about 30 houses, the houses are closely attached. On the rooftops piles of dry big logs and woods stored for many years as status, which reflects prosperity of the society which is common traditions in this arid areas of Mustang and in Tibet where woods are very scarce. Day 12 Trek to Tetang 3,040 m - 06 hrs. Walking on barren wilderness of red earth landscapes in complete ambiance the path is gentle for few hours with views of distant snow capped peaks and the heading downhill and up at Tetang a small village for overnight stop around Yak pasture field. Day 13 Trek to Muktinath 3,760 m - 06 hrs. Walk from Tetang to Muktinath, heading towards Lower Mustang a long day before Jomsom, as the morning begins on a gradual winding trail where there is two routes to holy Muktinath direct while the other leading Kagbeni. While our route leads north east trail, passing several temporary huts and shelters of Yak herders, the high path with super views of Nilgiri’s peaks and Dhaulagiri range, trail winds on the gradual with much wider trail to Muktinath for overnight stop, afternoon visit the holy Muktinath temple and its premises. Muktinath, a sacred pilgrimage area where people from Nepal and India visits here to offer prayer and to Liberate from bad deeds, as the Mukti means to be free, here natural elements are displayed in miraculous form-flickering blue flames of natural methane gas burn on water, stone and earth an offering said to have been first lighted by Brahma, the Hindu creator, this natural wonder have awed man from the beginning, for Muktinath sanctity goes back into antiquity of 2,300 years ago. This area is equally holy for Hindu and Buddhist, around Kaligandaki and Muktinath pilgrims search for black shiny fossils called Shaligram (ammonite), found in abundance around this area. Day 14 Trek to Jomsom 2,715 m - 04 hrs. 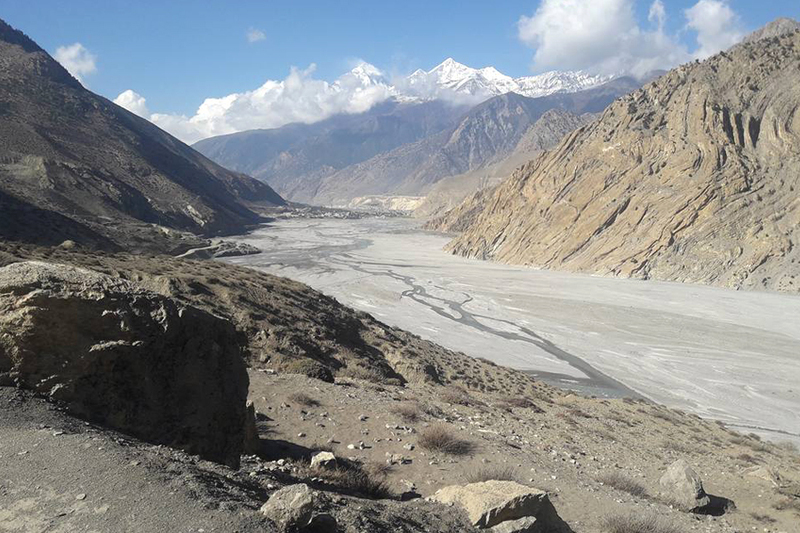 Today final and last of trekking of this memorable trip leads you all the way to Jomsom town, starting morning walk to reach down at Kaligandaki River Valley, following windswept river valley all the way to Jomsom town after a good walk of four hours. On reaching Jomsom check into its nice cozy lodges for overnight. Here one can celebrate with local apple products. Day 15 Fly to Pokhara and transfer to hotel. Morning walk to Jomsom airport for short scenic flight to reach at picturesque Pokhara valley, during air amazing views of Dhaulagiri and Annapurna Himalayan peaks, as the plane land at scenic Pokhara. A popular and main touristic destinations of Nepal, overlooking massive Annapurna Mountains with serene Phewa Lake where our hotels located, afternoon free for individual activities and souvenir shopping or just relax and enjoy the views. Day 16 Drive or fly to Kathmandu and then transfer to your hotels. Day 17 Depart for your next destination. 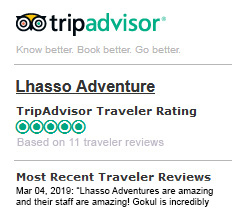 Last day in Nepal after a wonderful experience and adventure on Upper Mustang Trek with great service of Lhasso Adventure, and as per your international flight then transfer to Kathmandu international airport for your respective destinations. Trip Grade : Moderate and Adventurous. Max Altitude : On crossing Nyi La pass at 3,950 m high. Accomodation: On Hotels and Lodge on treks. Best Season : April to November months includes monsoon months of June to August also, as Upper Mustang located on rain shadow areas least affected by monsoon clouds blocked by chain of Himalayan peaks.